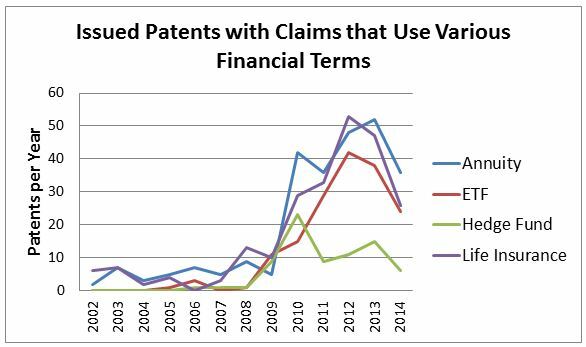 For the first half of 2014, the Patent Office issued patents related to financial services at historically high rates. Then Alice happened. 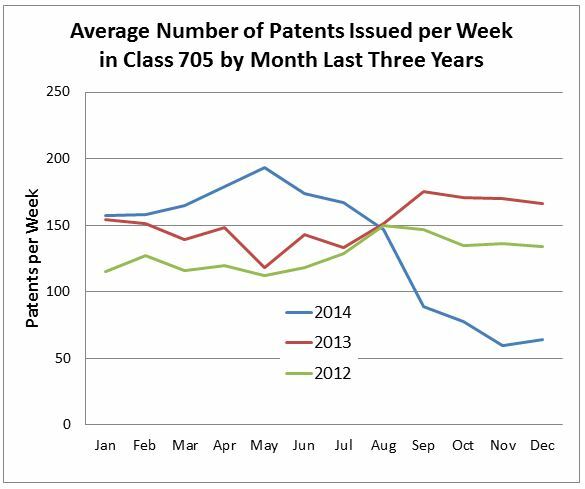 The last quarter of 2014 saw a significant decline in granted patents for financial services. The numbers are striking. 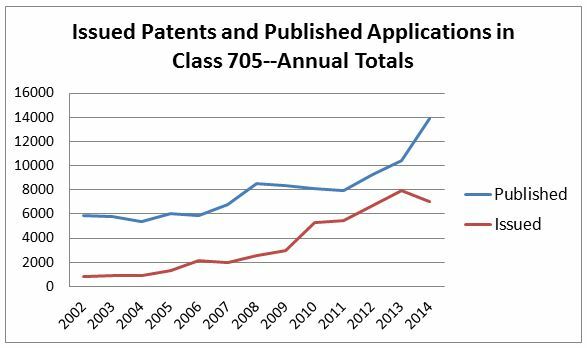 In the Patent Office class for Data Processing: Financial, Business Practice, Management, or Cost/Price Determination (Class 705), the Patent Office issued patents at an average rate of 172 patents per week for the first six months of the year. Over the last four months, the average rate dropped to 73 per week, a decrease of 57%. This decrease can be seen in the graph below showing the average grant rate in Class 705 over the last three years. As can be seen in the graph below, the reduction in grants is even more pronounced in some of the financial services subclasses. In the Finance (705/35) and the Trading, Matching and Bidding (705/37) subclasses, the grant rates declined by 76% from the first half of the year to the last third. Similarly, in the Insurance Subclass (705/4) the grant rate in the last four months was 80% lower than the average rate in the first six months. The Portfolio Selection Subclass (705/36R) saw an 85% reduction between the same periods. These sharp drops lagged the Supreme Court Alice decision about about six to eight weeks (roughly the time it takes for an allowed patent application to be issued). The grant rate for the last few months may not accurately predict the rate going forward. 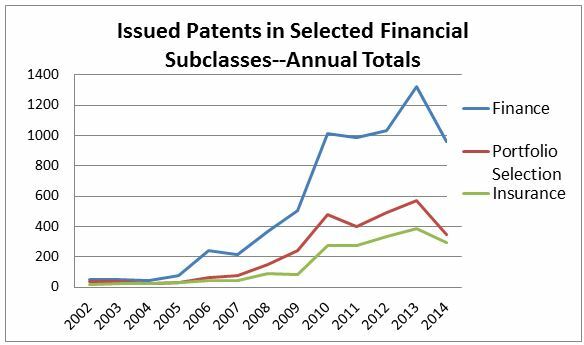 It could be that that the Patent Office has been reviewing fewer applications in these classes. Or it could be that Examiners have been reluctant to grant allowance of claims as the Examiners were becoming familiar with the temporary guidance based on Alice and awaiting more complete guidelines. So far the cases that have been examined have included claims that were largely prepared and submitted before the Alice decision. As patent attorneys have a chance to craft applications that take into consideration the Alice case and the Patent Office’s implementation of Alice, grant rates may increase. For some perspective, the grant rate for the last four months of 2014 (about 3800 per year) is still higher for Class 705 than any year prior to 2010. Additionally, 2014 saw by far the largest number of published applications in Class 705 ever. So, while the grant rate of patents related to financial services is likely to decrease from recent highs, these patents will remain a significant consideration for financial services companies. 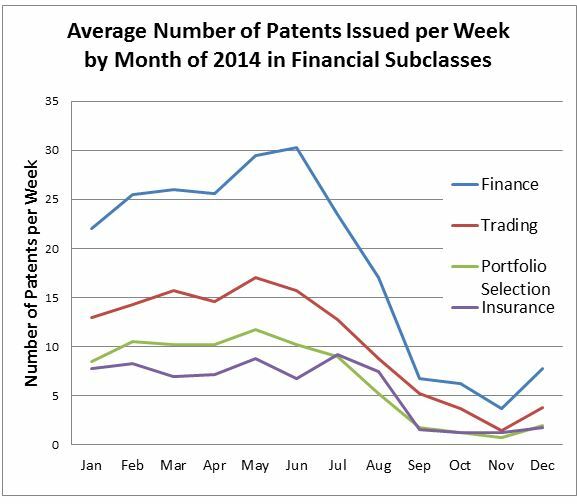 For the sake of completeness, I’ve also attached a few additional charts illustrating the overall trends for financial services patents over the last several years. All of the data used to create these have been collected using the freepatentsonline.com website.